Lipid metabolism disorders can lead to hyperlipidemia that triggers atherosclerosis. This study aimed to identify the potential of standardized ethanolic extract of red spinach (Amaranthus tricolor L.) to prevent hyperlipidemia by referring to the reduction of triglyceride level and total cholesterols in male Sprague-Dawley rats. A total of 30 experimental animals was put into 6 groups, including normal, positive control (0.9 mg/kgBW of simvastatin), negative control, treatment I (200 mg/kgBW of extract), treatment II (400 mg/kgBW of extract), and treatment III (800 mg/kgBW of extract). Preventive therapy and positive control were administered from day 1 to day 67. Hyperlipidemia was induced by feeding pure lard and duck yolk to the rats twice daily from day 8 to day 67. Determination of triglyceride level and total cholesterols was conducted on day 0 and day 67. The findings revealed that the treatment groups with ethanolic extract of red spinach at doses of 200 mg/kgBW, 400 mg/kgBW, and 800 mg/kgBW had statistically significant differences (p<0.05) compared to the negative control group. The treatment III group with a dose of 800 mg/kgBW showed the most reduction of total cholesterol and triglyceride levels, which was the same as the positive control group. In conclusion, standardized ethanolic extract of red spinach possessed preventive activities against atherosclerosis based on the total cholesterol and triglyceride parameters. The highest activity was demonstrated by the dose of 800 mg/kgBW group. 1. American Heart Association, et al. Prevention and treatment of high cholesterol (hyperlipidemia). American Heart Association, Dallas, 2017. 3. Benjamin EJ, Blaha MJ, Chiuve SE, Cushman M, Das SR, Deo R, et al. Heart disease and stroke statistics—2017 update: a report from the American Heart Association. Circulation. 2017 Mar 7;135(10):e146-e603. doi: 10.1161/CIR.0000000000000485. 4. Ekor M. The growing use of herbal medicines: issues relating to adverse reactions and challenges in monitoring safety. Front Pharmacol. 2013;4:177. 5. Kumar G, Singh YK, Prabhat P, Ali MR, Kumar M. Natural Product and Health-A Review on All Aspects. Current Research in Pharmaceutical Sciences. 2013;3(3): 68-79. 6. Alam S, Krupanidhi K, Sambasiva Rao KRS. Evaluation of in-vitro antioxidant activity of Amaranthus tricolor Linn. Asian J Pharmacol Toxicol. 2013;1(1):12–6. 7. Pradana DA, Anggriani ID, Setyaningrum TR. Potential of red spinach leaves ethanolic extract (Amaranthus tricolor L.) as a complementary therapy For Hiperlipidemia: Study in Vivo of histopathologic and activity of Alanin Aminotransferase (ALT). J Sains Farm Dan Klin. 2016;3(1):6–13. 9. Bentz AB. A review of quercetin: chemistry, antioxidant properties, and bioavailability. J Young Investig. 2009;19(10):1762-70. 11. Asmariani WG, Probosari E. Pengaruh pemberian buah pepaya (Carica papaya L.) terhadap kadar kolesterol LDL dan kolesterol HDL pada tikus Sprague-Dawley dengan hiperkolesterolemia. Journal of Nutrition College. 2012;1(1):257-264. 13. Kusuma AM, Asarina Y, Rahmawati YI, Susanti S. Efek Ekstrak Bawang Dayak (Eleutherine palmifolia (L.) Merr) dan Ubi Ungu (Ipomoea batatas L) terhadap Penurunan Kadar Kolesterol dan Trigliserida Darah pada Tikus Jantan. 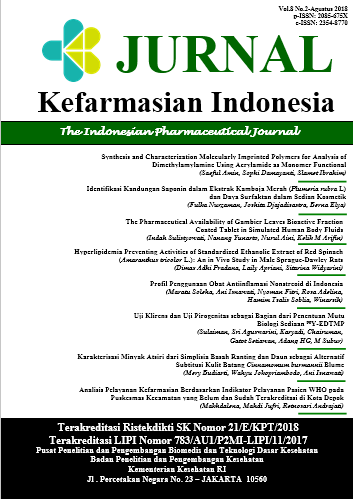 Jurnal Kefarmasian Indonesia. 2016; 6(2):108-16.